This is the first event in a series of sporting lunches to be held at Boisdales restaurant in Canary Wharf, with a second one being held on the 15th May with Alastair Cook the England Cricket captain. Harry Redknapp will come to Boisdales to speak about his illustrious career in football, the controversies and the state of the game today. Guests will enjoy a Champagne reception, three course lunch and a speech by Harry, together with a QandA hosted by Gladstone Small the ex England cricketer and avid Aston Villa fan! 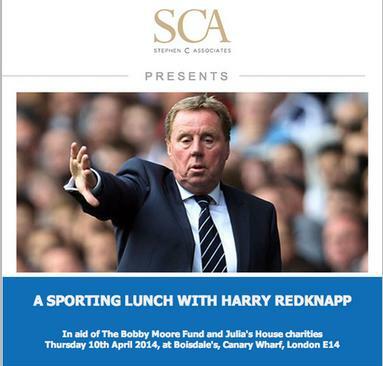 There will be plenty of opportunities for autographs and photographs with Harry during and after lunch and we will also be raising funds at an auction for 2 of Harry's chosen charities, The Bobby Moore Fund and Julia's House. The convivial surroundings of Boisdales will make this event one not to be missed! The ticket price includes a Champagne reception prior to lunch, 3 course lunch, speech by Harry and a QandA hosted by Gladstone Small together with a charity auction and an after lunch cash bar facility. The event starts at 12:30pm and is designed so that guests can return to work after the lunch or stay and drink and chat with colleagues and friends. Tickets are limited, so book now to reserve your places.